Salty and full of flavor, Serrano ham makes an excellent contrast with sweet, juicy honeydew melon. This Spanish tapa recipe known as melon con jamon serrano (melon with serrano ham) takes about 5 to 10 minutes to prepare and requires no cooking. If you are short on time and need to bring something to a potluck or friend’s barbecue, this is the tapa for you! Melon with serrano ham is also a refreshing dish to serve at a brunch or lunch—whenever melons are in season. Rinse the melon and pat dry. Cut melon in half, remove seeds and cut away the rind. Cut into 1 1/2-inch cubes. 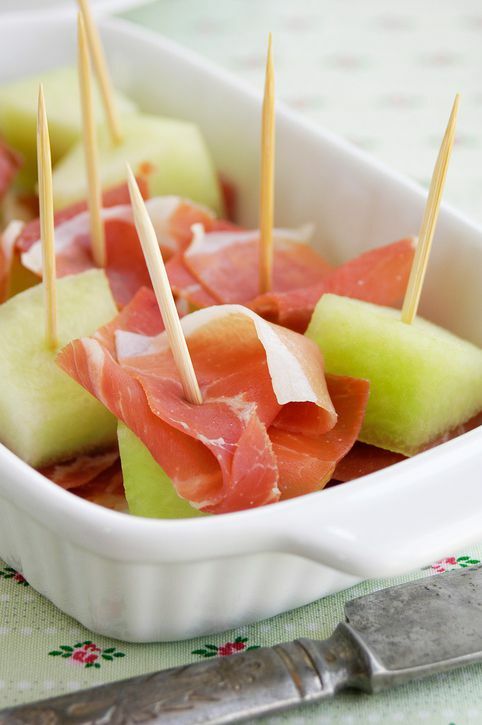 Cut ham slices in half and wrap each melon cube with ham. Use toothpicks to hold ham in place. It is best to prepare these at the last minute because the melon can waterlog the ham making for a soggy appetizer. They are so easy to prepare, however, that they can be whipped up even as your guests are arriving or right before transporting them to a party. What Is the Recipe for Smoked Salmon With Cream Cheese Tapas?